Basal encephaloceles occur with an estimated incidence of 1 in 35,000 live births and have been further subdivided, depending on the location of the bone defect, into transethmoidal, sphenomaxillary, sphenoorbital, and transsphenoidal. , Transsphenoidal encephaloceles are rare and of which the transalar variety is the least common. Our patient had presented with respiratory distress and an oropharyngeal mass in the neonatal period and was eventually diagnosed to have transalar transsphenoidal meningoencephalocele. A 30-day-old male infant weighing 2.6 kg presented with difficulty in breathing and feeding noticed since 4 th day of life. He was born at term gestation with an uneventful antenatal course. There were no maternal risk factors for sepsis and no history suggestive of asphyxia. The infant was observed to have tachypnea with a respiratory rate of 70 breaths per minute along with marked suprasternal retractions and stridor, though cyanosis was absent. There was no pallor or facial dysmorphism. Arterial blood gas analysis revealed normal oxygenation, and chest X-ray did not show any significant abnormality. The patency of all natural orifices was checked, and choanal atresia, tracheo-esophageal fistula, and anorectal malformation were ruled out. Echocardiogram and ultrasonography of the abdomen of the infant were normal. The infant failed to improve on oxygen, intravenous antibiotics, and supportive management. Examination of the oropharyngeal cavity showed presence of a cystic swelling protruding through the soft palate. The mucosa was smooth, attenuated at the tip, and purplish in color. Aspiration of the cyst with a 26-gauze needle produced a small quantity of clear fluid with no cells and a protein content of 80 mg% which was compatible with a transudate. Subsequently, after 48 hours of aspiration, the child had recurrence of symptoms and reappearance of the swelling. The computed tomographic (CT) scan with bone windows revealed a large defect in the sphenoidal base with herniating meningoencephalocele [Figure 1]. 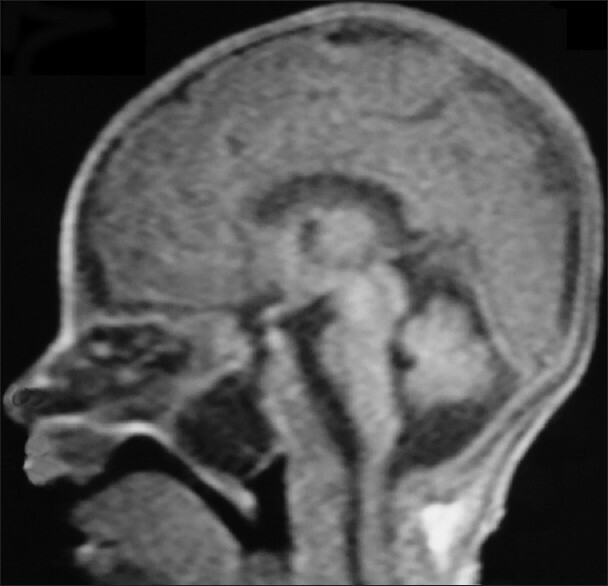 A transsphenoidal encephalocele was diagnosed on the magnetic resonance imaging (MRI) [Figure 2]. The patient was successfully operated on 40 th day of life using the transpalatal approach involving a multidisciplinary team comprising neurosurgeons and otolaryngologists. During follow-up on 70 th day of life, the child is stable, accepting breast feeds, and neurologically normal. Obstructive lesions of the newborn airway include choanal atresia, macroglossia, Pierre-Robin syndrome, lymphangioma, teratoma or other mediastinal masses, cysts, subglottic stenosis, and laryngotracheomalacia. Symptoms as a result of a basal encephalocele vary according to the site and size of the lesion. The common presentation is that of a mass, usually in the midline. Airway obstruction may result from lesions in the nose, nasopharynx, and oropharynx. Consequently, respiratory distress, episodes of apnea, difficulty with feeding, and failure to thrive can be seen. CSF rhinorrhea and recurrent meningitis may also occur. Severe respiratory distress and feeding difficulty as seen in our patient were attributable to pharyngeal airway obstruction. 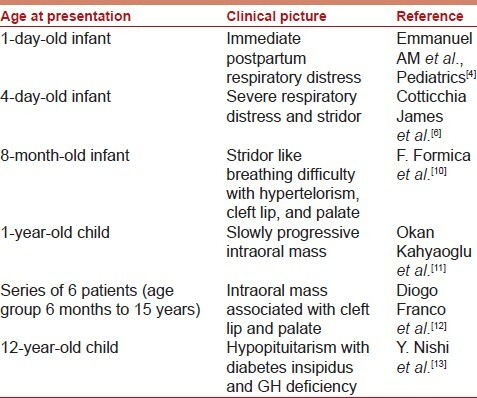 Only 11 pediatric cases of transalar transsphenoidal encephaloceles have been reported in the literature, with two of them presenting in neonatal period with respiratory distress [Table 1]. Our case had difficulty in respiration and feeding since first week of infancy. He was observed to have a cystic mass protruding through the soft palate which was diagnosed on neuroimaging as transalar transsphenoidal meningoencephalocele. There was no other congenital malformation noted in our case. The majority of transsphenoidal meningoencephaloceles are diagnosed during the first year of life due to manifestations such as respiratory distress caused by epipharyngeal obstruction, feeding difficulties, cranial midline defects with cleft lip or cleft palate, hypertelorism, optic malformations with anophthalmia, retinal abnormalities, optic nerve hypoplasia, unexplained bouts of recurrent meningitis, or endocrine abnormalities. Associated congenital anomalies have been noted in one third of the cases of sphenoidal encephalocele. However, if there are no considerable difficulties and no distinctive facial anomalies during childhood, the diagnosis of the disease may be delayed up to adulthood, when distinctive symptoms such as rhinorrhea, visual defect, or endocrine dysfunction occur. Advanced imaging studies are necessary to confirm the diagnosis of transsphenoidal encephalocele and to define any neural or vascular elements that may be included in the herniation. CT scan and MRI are the most useful modalities for diagnosing meningoencephalocele. In the present case, CT scan including 3D reconstruction allowed visualization of bone defects in the skull base and a well-circumscribed expansile mass lesion in the extracranial area communicating with the intracranial space. MRI with gadolinium enhancement evaluated the content of the encephalocele and eliminated other brain anomalies. Transsphenoida[l encephalocele is frequently accompanied by a split palate, and these conditions can be operated upon at the same sitting via the transpalatal approach. There is also less risk of damaging the functioning tissues within the wall of the encephalocele in transpalatal surgical approach. In conclusion, this case is unique because it concerns an infant with severe respiratory problems from the time of birth as a result of a transsphenoidal encephalocele presenting as an oropharyngeal cystic swelling. Obstructive causes of respiratory distress in neonatal period are rare and pose a diagnostic challenge. A detailed oropharyngeal examination should be considered in a neonate with respiratory distress with no apparent cardiac or respiratory cause. It is important to consider early neuroimaging for diagnosing these conditions and plan definitive treatment for successful outcome. 1. David DJ, Proudman TW. Cephaloceles: Classification, pathology and management. World J Surg 1989;13:349-57. 2. Jatre A, Tabbador R, Samaraweera R. Transsphenoidal meningoencephalocele. J Neurosurg 1992;77:949-51. 3. Mahapatra AK. Anterior encephaloceles. Indian J Pediatr 1997;64:699-704. 4. Mylanus EA, Marres HA, Vlietman J, Kollée LA, Freihofer HP, Thijssen HO, et al. Transalar sphenoidal encephalocele and respiratory distress in a neonate: A case report. Pediatrics 1999;103:e12. 5. Blumenfeld R, Skolnik EM. Intranasal encephaloceles. Arch Otolaryngol 1965;82:527-31. 6. Sedwick JD, Gianonni C. Bronchogenic cyst of the oropharynx and hypopharynx in a neonate. Otolaryngol Head Neck Surg 2001;125:105-6. 7. 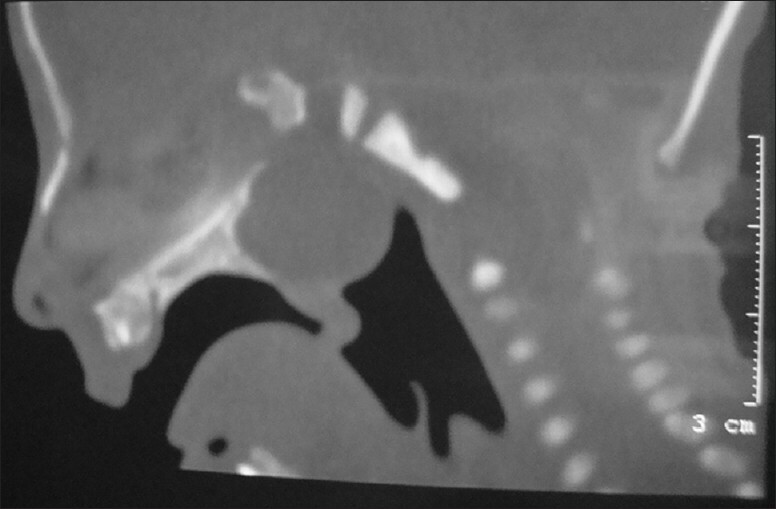 Chin AC, Ramakrishnan J, Slatton D, Griessler G. Congenital cysts of the third and fourth pharyngeal pouches or pyriform sinus. J Pediatr Surg 2000;35:1252-5. 8. Narsimhan K, Coticchia J. Transsphenoidal encephalocele in a neonate. Ear Nose Throat J 2006;85:420-2. 9. Yokota A, Matsukado Y, Fuwa I, Moroki K, Nagahiro S. Anterior basal encephalocele of the neonatal and infantile period. Neurosurgery 1986;19:468-478. 10. Formica F, Ianelli A, Palludetti G, Di Rocco C. Transsphenoidal Meningoencephalocele. Childs Nerv Syst 2002;18:295-8. 11. Kahyaoðlu O, Cavuþoðlu H, Müslüman AM, Kaya RA, Yilmaz A, Sahin Y, et al . Transsellar Trannspnenoidal rhino-oral encephalocele. Turkish Neurosurg 2007;17:264-8. 12. Franco D, Alonso N, Ruas R, da Silva Freitas R, Franco T. Transsphenoidal Meningoencephalocele associated with cleft lip and palate: Challenges for diagnosis and surgical treatment. Childs Nerv Syst 2009;25:1455-8. 13. Nishi Y, Muraki K, Sakoda K, Gen M, Uozumi T, Usui T. Hypopituitarism associated with transsphenoidal meningoencephalocele. Eur J Pediatr 1982;139:81-4. 14. Tsutsumi K, Asano T, Shigeno T, Matsui T, Ito S, Kauzi H. Transcranial approach for transsphenoidal encephaloceles: Report of two cases. Surg Neurol 1999;51:252-7. 15. Abiko S, Aoki H, Fudaba H. Intrasphenoidal encephalocele: Report of a case. Neurosurgery 1988;22:933-6. 16. Lewin ML. Sphenoethmoidal cephalocele with cleft palate: Transpalatal versus transcranial repair: Report of two cases. J Neurosurg 1983;58:924-31.